Designed for medium-large capacity processing lines with belt width up to 1500 mm, the Single Drum Spiral Freezer (SF) is suitable for almost any processing line. Extra strong belt supports makes it possible to carry heavy products demanding a long retention time. 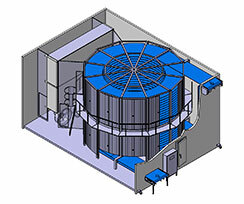 The spiral freezer is the most flexible spiral solution and can be adapted to fit almost any processing line.